To see more of this seller's radios, visit Tom Albrecht's Radio and TV Attic. 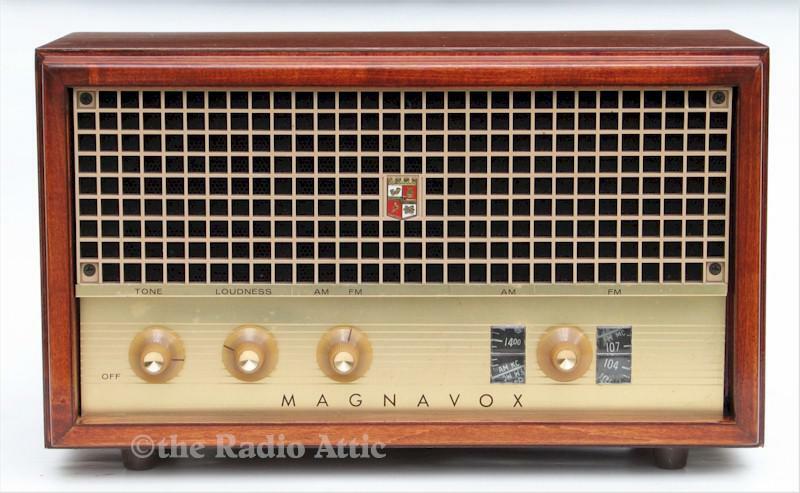 Here's a good-sounding Magnavox AM/FM table radio from the late 1950s. The cabinet was originally clothed in a nonrestorable artificial wood grain, and has now been "restored" with better-than-original real mahogany veneer. The gold panel looks nice, although there are some minor spatters on it that are not easily removable. The seven-tube (plus solid state rectifier) chassis is a good performer with excellent sensitivity on both AM and FM, and the 4x8-inch speaker puts out nice quality sound from this wooden cabinet. Chassis restoration included replacement of electrolytic and paper capacitors, replacement of a few resistors, a strong set of tubes, cleaning of control and tube socket contacts, and a full RF/IF alignment for both AM and FM. Getting the FM alignment right is what makes these 1950s FM radios really sing. You'll enjoy listening to music on this one. Lighted dial. 15-1/2"W x 9-1/4"H x 7-3/4"D.
You are visitor number 1,422 to this page.